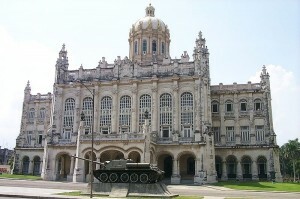 Its halls contain a detailed panorama of the country’s struggles for national sovereignty in a historical discourse supported by abundant testimonial material made up of photographs, original documents, mock- ups, weapons, personal belongings of revolutionary fighters, recordings, videos and films. Adjacent to the Museum is the “Granma Memorial,” the immense glass case holding the yacht used by Fidel Castro and over 80 revolutionary fighters to return to Cuba from theirexile in Mexico. The landing took place on December 2, 1957, at a point on the southern coast of Oriente Province, and that was the.beginning of the Liberation War in the Sierra Maestra Mountains. Open: Tuesday to Saturday: 13:00 to 18:00. Sundays: 10:00 to 13:00. Closed Mondays.